It’s so nice to have my laundry life back in order (er, create some order in the laundry room), I’m so excited to show you what has been going on behind the scenes. 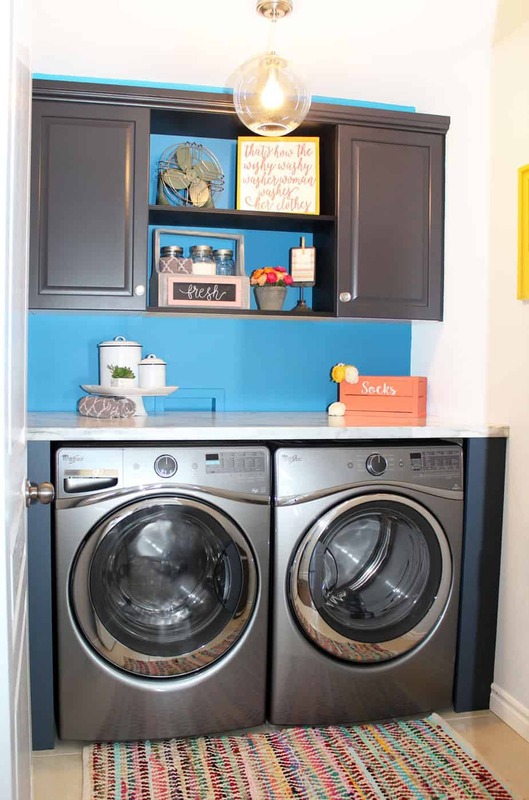 My laundry room ideas are quite simple, considering the space is only 66″ wide there wasn’t a lot of room to get fussy. This laundry room went from a tiny hole in the wall that never had an open door, to a space that I’m proud to show off. Would you believe that it all came together in about the time you’d have in a weekend?! I’d be lying if I told you we didn’t run into a few hiccups- like a giant snow storm on delivery day, a crushed dryer vent, an awkward placed electrical outlet, and changing the light fixture 3 times. But we muddled through to a beautiful laundry room on the other end! 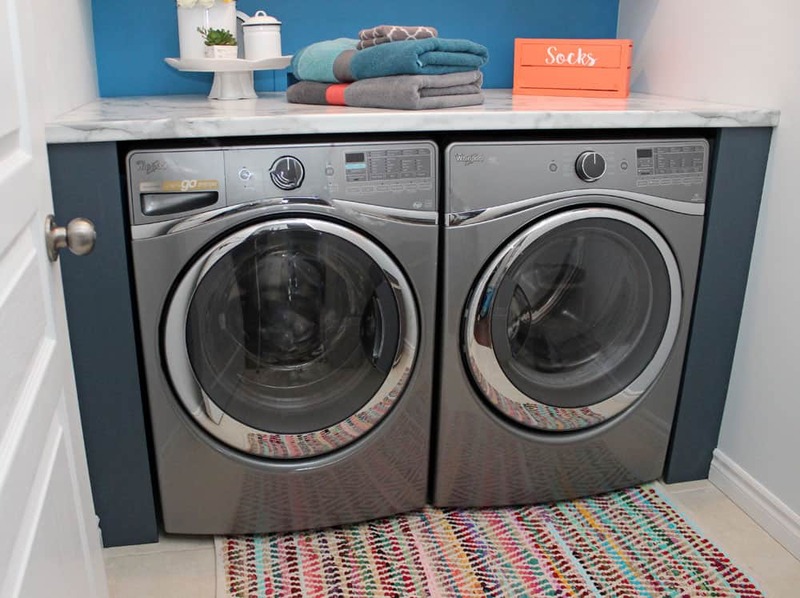 A big part of what is making this laundry room design so efficient and functional with our family is the the new Whirlpool front load Duet Steam Washer and Dryer (more on that to come). By switching to a front loading pair we were able to incorporate a counter into the laundry room. This was a big ‘must’ since we had nowhere to fold the laundry, you can read more about that mess here. 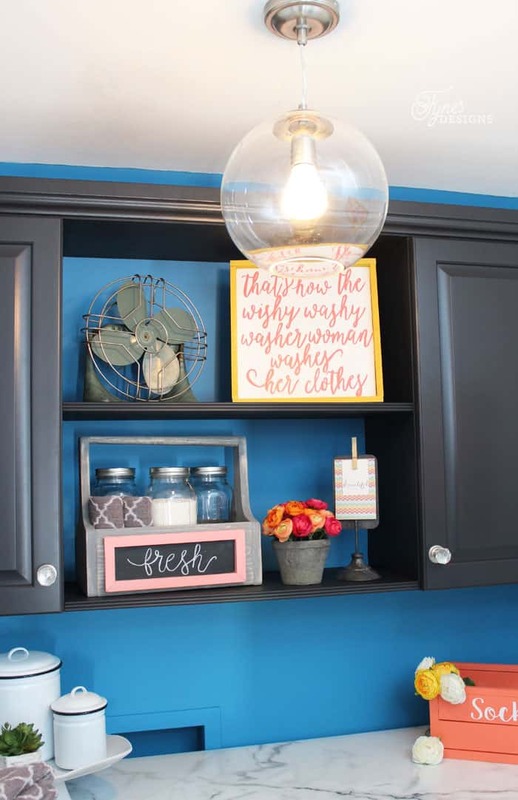 Everything used to complete the laundry room was picked up at The Home Depot. I was so happy to find these Buckingham Grey cabinets in-stock. They looked like they were pre-ordered, with the matching crown moulding it gave the laundry room cabinets an expensive custom built look. I was able to assemble the cabinet boxes myself, and had Captain Carpentry (aka my brother) install them for me. 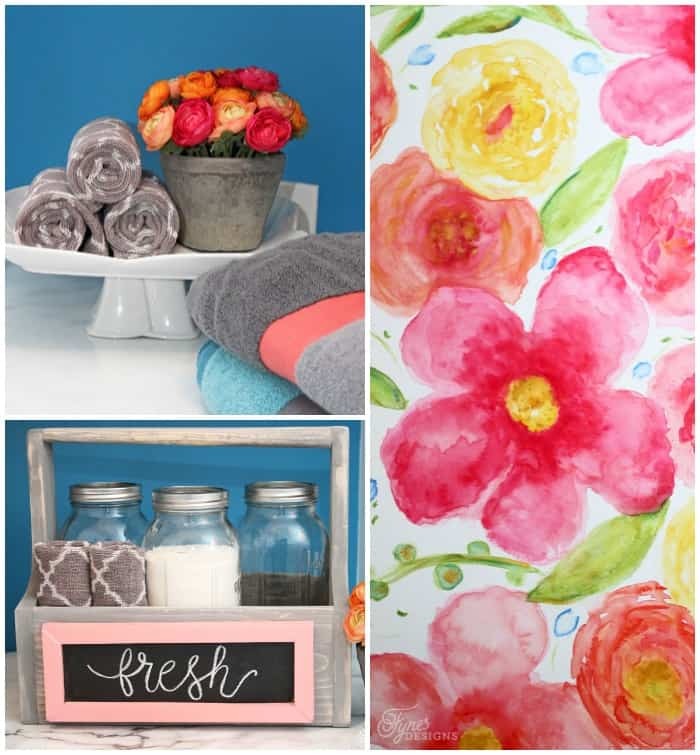 Doesn’t the DIY Watercolor artwork add the perfect pop of feminine color? The countertop is a bit of a luck story. My initial plan was to buy a sheet of plywood and cover with solid light grey piece of Arborite to create a custom countertop, like I did for my craft room desk. However when consulting with the kitchen expert at the Home Depot he had the perfect thing for me. Someone had custom ordered a bar top piece of counter, but it had got damaged during transport, it was just out back, lonely, waiting for a home. It wasn’t the pattern I was after but the clearance price was too good to pass up, plus the damaged part was on the end that needed to be cut off anyhow! The shelves in between the cabinets are laminated pine panels edged with a small piece of trim on the front edge. They are screwed in place from the inside of the cabinet into the pine. Having a can of paint color matched to the cabinet doors was the key to getting these in stock cabinets to look custom built. 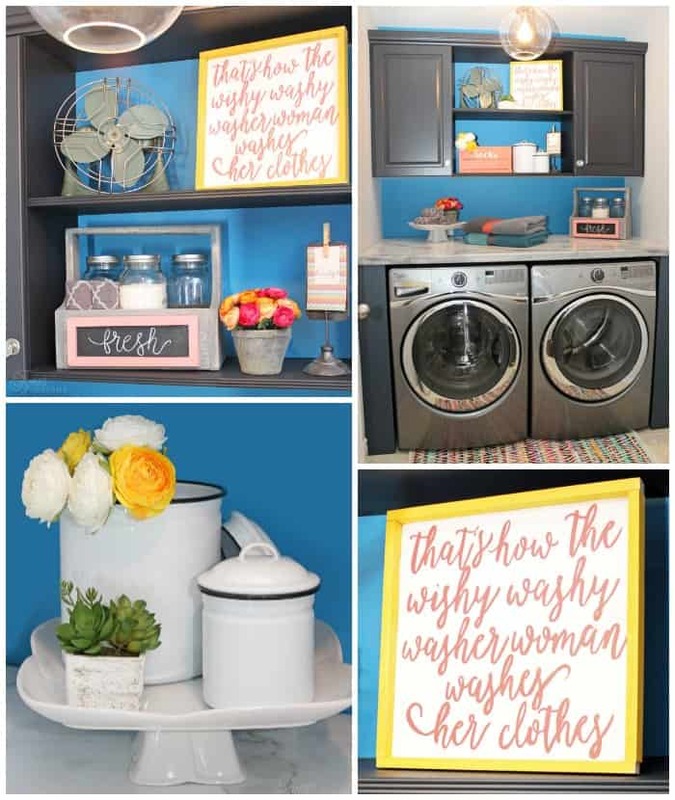 You can read all about the Voice of Color Laundry room color scheme here. Would you believe that I tried 3 light fixtures in this room before I found one that would actually light up the space! I never realized how dreadfully dark it was until I found a light fixture to properly light this small windowless room. This glass globe pendant fixture was the cheapest of the 3 and gave the best light. The biggest snafu of the space was the previous placement of the water outlet trim box and electrical outlet. The top loading pair was high enough to cover it, but it wasn’t concealed with the new front loading set. Captain Electrical (aka Mr. Fynes) was able to put a new plugin below, but the trim box wasn’t moveable, so I just gave it a lick of paint and decided to live with it. 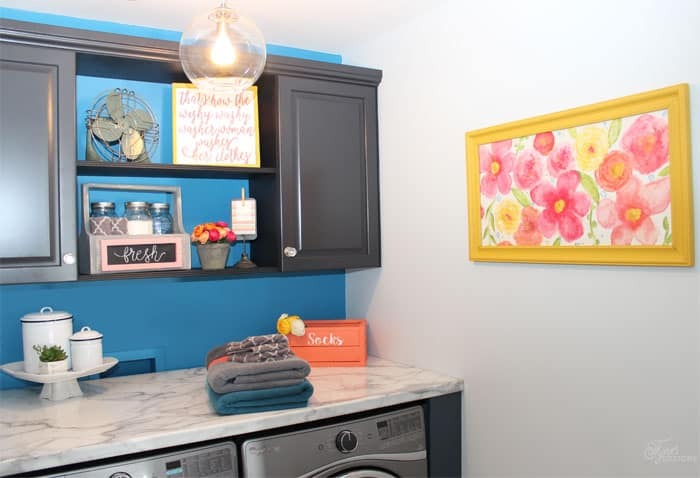 I’m really happy how my laundry room ideas came together. The few bumps in the road were soon forgotten after using this new functional space. Would you believe the Laundry Room Makeover materials came in around $550, I couldn’t be happier! Check out the supply list here. A HUGE thanks to my friends at The Home Depot Canada, Captain Carpentry, and Captain Electrical that helped bring this fresh new laundry room to life. It’s the perfect laundry space for our little family! Disclosure: Special thanks to The Home Depot Canada, Whirlpool Canada, and PPG Voice of Color . As always the opinions expressed in this blog post reflect my honest opinion. Oooooo la la! Love it! Oh we are in the same boat! I think I might be making room on the counter for a TV, maybe that will be the incentive I need! Great job ! Absolutely love it. LOVE! I’m thinking that blue paisley may end up in my office! Virginia – this is beautiful! I love how it turned out! It looks so much more functional (and more beautiful) – great work! It looks amazing Virginia!! I love it – that washer and dryer are gorgeous, wow! Looks great,you always have amazing ideas. 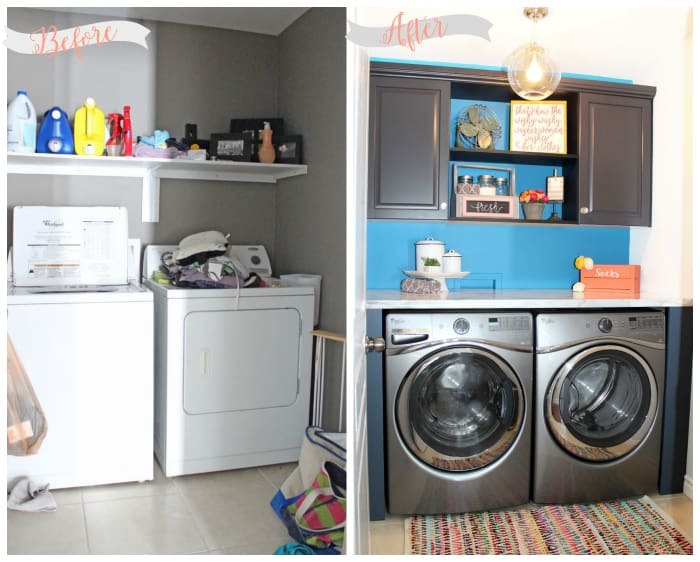 Your laundry room makeover is fabulous. I don’t think my husband is going to like you very much when I show this to him. LOL. Our laundry room looks like your before photo and I am thinking we need a redo. Thanks for sharing your ideas. This is AMAZING! That watercolor is perfect for the space. Absolutely gorgeous!! Love the colors and how everything came together!! WOW! Huge change! I love the color scheme! I may actually like doing laundry in a place like this! Its a stretch to put like and laundry in the same sentence, but I’m getting there with this new space! Gorgeous! I love that blue and all of the adorable little details. Great job! I absolutely adore the color scheme!! And what a score with the countertop! My laundry room is on year 3 of me “remodeling” it and this just gave me a burst of motivation to get it done! Great job! So glad I could give you a boost! it is certainly rewarding when it is all finished! What a marvelous space! I wouldn’t mind doing laundry in there AT ALL! 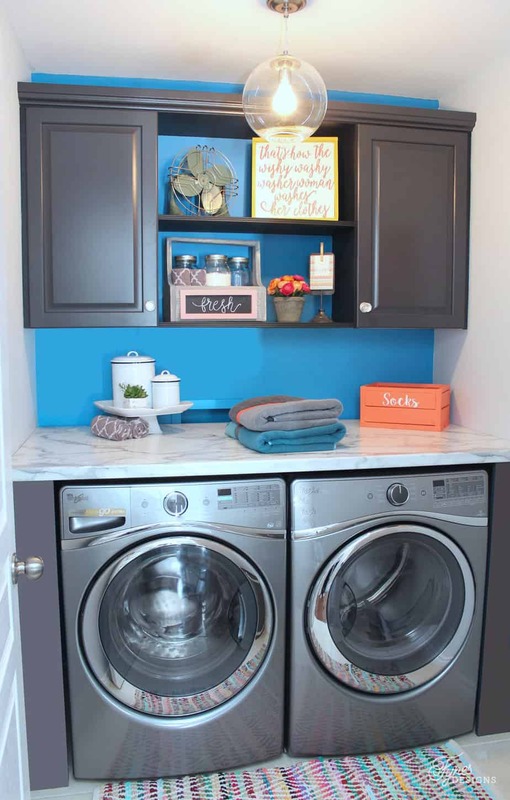 Now that’s a laundry room that would make doing laundry enjoyable!! Love the grey and blue color combo! I love everything about this! The color palette . . . the art . . . love it!